When I was in my Elementary school, I had read a remarkable story. This was a Hindi translation from a Russian original written by a talented Russian author who was also ambidextrous (literally). He used to write with his right hand and draw pictures using the left (or perhaps vice versa). So anyways, it is about the animals looking for a shelter in the rain. One of them finds a mushroom and shows kindness to the other animals as they come by and allows them to take shelter under the same mushroom. When the rain is over, they come out of their shelter only to realize that the mushroom was able to accommodate the entire group because the mushroom itself had grown during the incessant rain. After last week's interesting discussion about adding/replacing mean with median, you will see a change with this week's update. As a consumer of this information, I consider the "mean" to be more useful in our use case. I do get a sense of the "median" by looking at the visual chart. However, I am a big fan of experimenting. Unless one prototypes, it is hard to change the status quo. I had predicted to myself that the median will stay at 1, or perhaps move up to 2 as we go week by week. Having stated my position about the "mean", I was in for a slight surprise. As you will see below the median too is more dynamic than what I had imagined. I also took the liberty of adding the "mode". 1. Should we keep it the old way - only mean? 2. Should we keep it the new way - with mean, median, and mode? 3. Should we only have median? Please use your upvotes on these three comments below so we know what would work best for us in the long run. S.Chx, Happy New Year to you too! @mhagiwara has joined the Japanese team! He is an expert in Computational Linguistics, and is the second Duolingo Engineer whose mother tongue is Japanese. mhagiwara, welcome to the fold! We've made an incredible amount of progress this week, with well over 1,600 sentences as of the time of this writing. The team is inching ever closer to the 50% mark, and by the end of the weekend, we will likely be there. Whenever you see our percentage go down, it's because we're adding new skills, and making the course more content-rich (the more words, the better)! We have been moving the skills around quite a lot, meaning you won't receive an identical format to the Swedish tree, but this is a good thing! After all, Norwegian is a different language, even if it is mutually intelligible. We're trying to keep our creativity high, both in sentence creation and lesson formatting. Below is a chart of our progress as of late. We are still progressing. We have been writing notes, editing sentences, and adding new ones. We have shed blood and tears. We have drank many many cups of çay and eaten so many pieces of simit (maybe that is just me). We do not have that much to report actually, but please stay tuned for more updates as we reach the end of our course development. Currently we are at 88%. Feel free to cheer us on and keep your eye peeled for our release in the coming weeks*. *The coming weeks does not mean next week. The coming weeks does not mean two weeks. The phrase "the coming weeks" is intentionally vague. Please oh please do not write on mine or Selcen's wall asking for the date. We do not know! TL;DR Two (or more) courses might hatch in March. We have a growing incubator basket with as many as 23 eggs. From 50 total courses, we have quickly come to as many as 62! The next update is expected on Sunday, 1st of March at 4:00 pm UTC. Also very happy. This is so great. Nice excuse :). By the way, now that the course is 4/5 done have you started looking for a good TTS engine? I came across an interesting solution for Esperanto TTS on the Lernu forums (thanks Lernu user IronChef!). You can use a Polish TTS and play around with the spelling a bit to get something very close to Esperanto. I tried IVONA's Agnieszka with the sentence "Czu wi povas prononcy esperanton? Jes. Mi povas diri 'preskał fresza czecha mandżarzo'." And it worked well enough. The main problem that I see is that Polish palatalizes some letters before i, so I had to change "prononci" to "prononcy" which alters the vowel quality a bit, but sounds closer. I also had to change "vi" to "wi" because it was reading it as the Roman numeral 6. Otherwise, I think it would be pretty straightforward to set up a script to handle the supersignoj (s/ŝ/sz/G; s/ĉ/cz/G; s/ŭ/ł/G; ktp.) and feed it into a Polish TTS. Thanks for the info! I'll definitely pass this along to our Esperanto course mentor! True! Plus, some people say that since Zamenhof himself was from Poland, the closest pronunciation to the original would be Polish. But really, as long as it's comprehensible, it'll be good. Have you seen these Memrise courses? http://www.memrise.com/course/1105/speak-esperanto-like-a-nativetm-1/ There's a whole series, which have a pretty good amount of vocab. There are also courses in the same series for particles and affixes, to help with grammar. I have in my possession an old record of songs in Esperanto. It contains a spoken word track in which a man speaking Esperanto with a horrid English accent speaks about taking an international vacation in which he is able to communicate with locals through Esperanto everywhere he goes. This is followed by a round of several people speaking Esperanto with comically exaggerated national accents. I intend to eventually rip this record to mp3 and make it available on the internet in some format or another. Whenever that happens, I'll post the link somewhere on the Duolingo forum (probably the English language main forum because I don't plan on taking the Esperanto course). The closest pronunciation of a national language to Esperanto is that of the Serbians and Croatians. \2. Should we keep it the new way - with mean, median, and mode? I like it - it gives a bit more information without taking up tons of extra space. Thanks for trying this out! I of course like the median, and albernegiraffe brought me around to the mean. Don't know about the mode... anyone think of a good use for it? It gives similar information to the median in this case. As we were discussing last week the idea with the median is to see how typical courses are progressing. It seems like the mode gives the same type of information, albeit not necessarily as meaningful. Edit: Also, if you look 3 weeks back the reported median is 2.5 but the mode is 0. This tells us that a bunch of courses were stagnant but a bunch of others made a lot of progress. If the median and mode are the same/close then it's an even stronger indication of how the "typical course" is progressing. This sounds best to me. Median and mode doesn't really convey anything interesting that you can't easily get a sense of from the graph anyway - it just makes it more cluttered. If there were hundreds or thousands of data points and if the values came with decimals then it might be interesting, but not here. And now we have DNN reporter jitengore on the line with the latest from the incubator front line. 18% in two weeks is ridiculous! You guys must be working hard. It's so great to see the actual numbers approaching the supposed "95%" that Duo gives. Keep up the good work. I'm really looking forward to your course. Thank you!!! 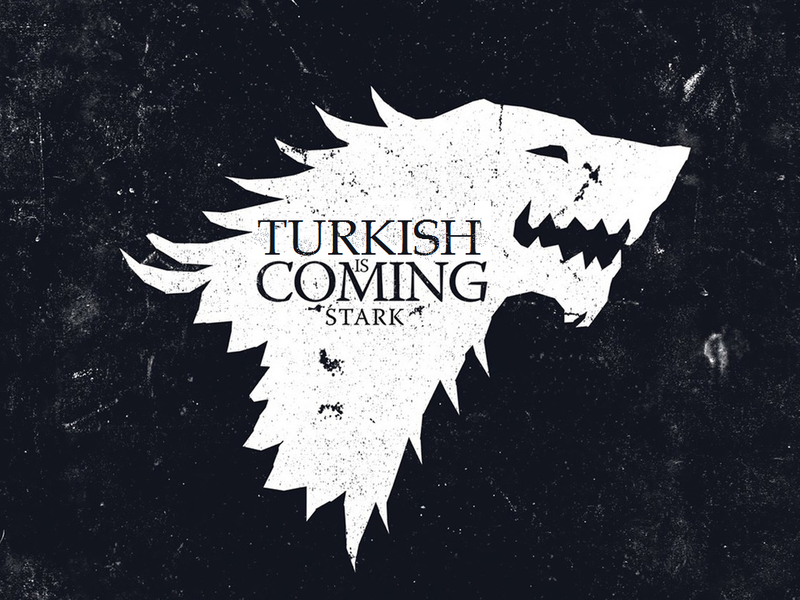 Get ready...Turkish is coming! You know, they should change Sunday into WIU-day! (I would at least, this is my Sunday evening entertainment :p) Thanks for your great work! Edit: I just realized that Duolingo seems to be quite interested in pushing the Japanese course to phase 3, considering that two staff members are actively working a beta course. I would love it if that was in preparation to get the Japanese for English speakers course started. I would love it if that was the first "problem course" to get started, by which I mean the first course that's causing lots of problems with the writing system. どうもありがとうございます Team Japanese for all your hard work and dedication! Maybe when we finish, there will be room for the next language of the Middle East!!! GREAT point. & THANKS AGAIN ALEX! :D I'm gonna lingot you up. LOL. They were getting tinier. Secondly, it was fairly time consuming to adjust their positions as the teams raced on causing reordering of the list. ^Was about to type this :) Jiten, you do an amazing job and we are all forever thankful! It's extremely helpful and exciting to see how the courses are coming along. it was fairly time consuming to adjust their positions as the teams raced on causing reordering of the list. I am a big fan of automated scripts, but only to a certain extent. Fully automated scripts are useful only when the consumers of such scripts are non-humans, imho :) (Thanks for your offer though! I will keep it in mind). I agree with Dessamator that perhaps there can be 80% automation, which is what I worked towards today. \1. 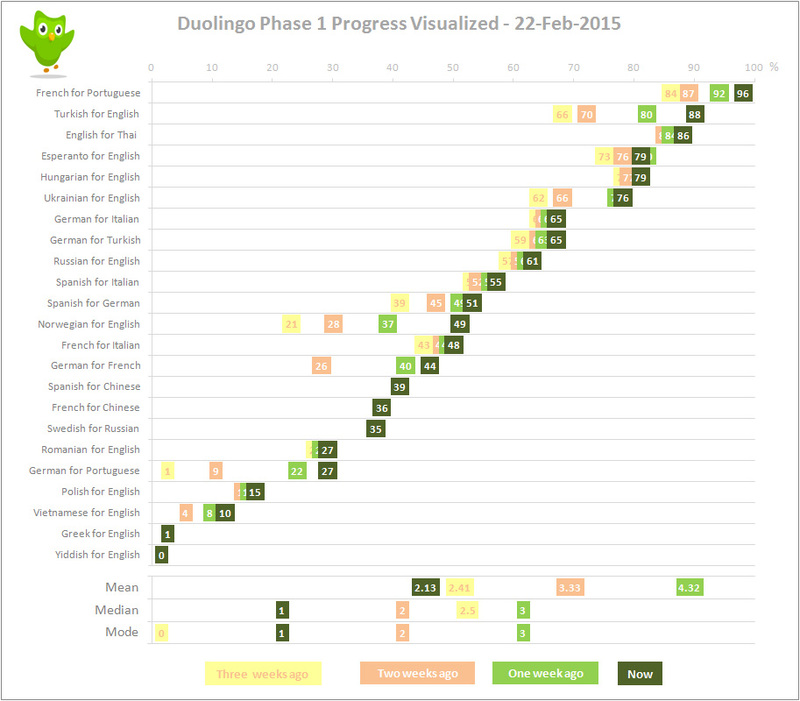 Duolingo's course progress assumes that the course tree is fixed and the progress is based on the extent of tree completed. For newer courses where the tree gets redesigned by the contributors during Phase 1, this logic fails. We have seen this happen for the Turkish, Hungarian, Russian trees. It is not possible to expect the teams to first work on completing the tree structure, freeze it, and then start their work, This is not practical. \2. Recently, the Duo team modified the progress metric for "xyz-Italian" courses to include the Localization strings. All of a sudden the courses exhibited ~20% progress which was artificially inflated. I like the ability to perform such sanity checks before the data is ready for consumption. My guess is that 80-90% of it could be done programmatically (including adding the markdown code). I actually created a personal RSS feed of the contributor updates using google apps scripts. I also recall someone created a script that basically checked their (Danish I think) progress every hour until the course graduated. Sounds great! Care to share it with the community? Sure, but you'll need an RSS feed reader to use it. I also programmed it to only store the last update of each course. So if contributors for a particular course add 3 updates in one day, only the last will be shown. I also recall someone created a script that basically checked their (Danish I think) progress every hour until the course graduated. Heh, that's cool (if a little obsessive!). Not really, it is really easy to set up using a built in timer of google apps script. I found the original danish spreadsheet (script). It's good to see that long-term lurkers Turkish and Hungarian for English and English for Thai are now getting close to completion. English for Thai will still take some time though. ATM there is only one active contributor and because of reasons unknown to me no new have been added during all those months. I don't know how that contributor will cope with all the reports alone. I wish some more contributors are added soon. Thanks for your patience. My post is now complete. Please use your upvotes (as described in the post) to express what works best for you. I am adding the three comments now. Is it okay to use this post to upvote and say I really don't mind? I mean, it's kind of cool to have all three there, but as far as I'm concerned, whatever works for you (and the teams - I don't know who sat down and calculated!) works for me, and you put so much into these reports already. I mostly look at the graph and the percentages the team provides, anyway! Good luck! If you have any questions, feel free to write on my stream. 8% on Turkish? say what? 8-o wow! GO TEAM TURKISH! I thought my eyes were deceiving me for a moment there! Your eyes deceive you not! We are trying to get the course done!!! Jiten, I love how suspenseful this is. Maybe you should fill it in intermittently more often :D I'm waiting on tenterhooks for the resolution of this cliffhanger. Seriously, though, these updates are amazing. Thank you so much. Thank you for all of the positive energy! We hope our course lives up to everyone's expectations! I find the mean to be more statistically significant than the median or mode, but there's nothing wrong with sharing the complete set of measures. I think you should just give us all three Jiten. Great job as always! Wow, the French for Portuguese course is almost out of the Incubator! Does anyone know when the last time a course exited the Incubator was? I believe the last course to leave stage 1 (hatching) and reach stage 2 (beta) was Swedish for English on 17th Nov 2014 . The Duolingo wiki has a page giving course info like this here. Yes, but it hasn't been updated in a while (the updates are manually added). I've always thought of making it update automatically, but wikia doesn't have the tools to do that. So currently it is only possible to update by relying on a human or third party tool, like a bot or a external app. It's been three months without a course hatching already, we need to fix that. Is Mandarin going to be added in the near future? Do you guys know anything about this? Because I see that are lots of languages being added for Chinese. Teaching Chinese is difficult (probably there is a lot the developers need to do), while teaching other languages (which already have a tree) to Chinese speakers does not require any changes to the system. So I have no idea when Mandarin will be added, and I guess even the staff does not really know. I don't know if you have any experience with Chinese, but it would be pretty difficult to format a Chinese Duolingo course. There are lots of things to be considered, like teaching characters (which give few or no hints to pronunciation) and/or pinyin (which gives only the pronunciation), not to mention writing exercises (since all characters are written a specific way) and speaking exercises. Mandarin would be an amazing addition to Duolingo, but it's only going to come with hard work on the development end. On the other hand, stroke order in Chinese is more important than in many other languages—both for correctness, and because it actually helps you learn the characters better (via the radical decompositions). I like how now there are median and mode progress statistics beside mean. Also I can't help but notice how the current percentages nearly form a nice diagonal line. \1. Should we keep it the old way - only mean? Come on French for Portuguese!! You're so close! I'm excited to that that course! :D Especially since I just finished my PT tree! It almost seems that the incubator basket has similarly grown to hold as many as 23 eggs now! And the rain is refusing to cease! So you can expect it to grow further in the coming weeks and months. What do you know what we do not know.... Now I am very curious - although I have my suspicions. Moderators always know more than regular users. But sometimes leaks happen. Like in these top comments. Unfortunately not much. But it seems that Duolingo has learned how to cope better with several simultaneous Phase 1 courses and taking care of several questions and requests from several contributors. You say the progress of the Russian team is from their own calculation, but where do you get this calculation from? Нет! That was supposed to be a secret! Team Russian is kind enough to send me their update via the incubator chat. Edit: And they base it on their assessment of their progress as per their course plan. They calculate it by how many more words and sentences are left to add to the course, I believe. For the past month and a bit we have been calculating our progress off of the assumption that the course will have 2160 words. Of course, this does not mean we will necessarily stop at 2160 words and in fact, we'd love to have between 2500 and 3000 although between 2100 and 2500 words is more realistic. Do you think you could leave the higher numbers for Tree 2.0? We're dying just to dive in! To be honest, I wrote down the list of A1 words we still do not have, and it is quite depressing. Duolingo's format has some limitation; the farther you go, the more material there is to throw out due to teaching difficulty (translation method works poorly for words that are hard to translate or when 5 words mean roughly the same and you get confused). I think, 2100-2500 duo-items is a fairly good number to stop at. By the way, 2160 is about the number of words we had before I started seriously fiddling with the tree, so this way our percentage at least stays consistent. Otherwise we'd had a sudden jump anytime I delete a gray sample skill in the template, especially that one time when I deleted a few of them. I can´t wait to review my Russian with Duolingo! And I´ll try to learn every language they give for English speakers... So far I´ve been up to the challenge! Team Rurkish it is amazing that you work this fast. I was already sad that I could not take the course in my break between Turkish classes but you might prove me wrong. I am so looking forward to that course. I will have an extra bite of simit. Hurra! We will be looking forward to you testing it out. I hope it helps. And Afiyet Olsun with the simit! Hooray for Team Russian and Team Norwegian!